Tick-tock, tick tock. Did you know that new pet owners often place clocks in a puppy’s bed, because the time-pieces simulate the sound of their mother’ hearts? Matters of the heart have often been associated with the fleeting nature of time, and this Valentine’s Day weekend, the Bemis Center for Contemporary Arts is bringing both together in Time 4 Love, an evening filled with high art and heady romance. On Saturday, February 12, art lovers will have an opportunity to bid on unique clocks created specifically for the Bemis Center’s annual Valentine’s Day event. Over 100 artists have been invited to participate, and each will embellish a 9 1/2 –inch diameter clock with his or her own signature artistic style. The gala evening kicks off with a Silent Auction from 7:00 – 9:00 p.m. 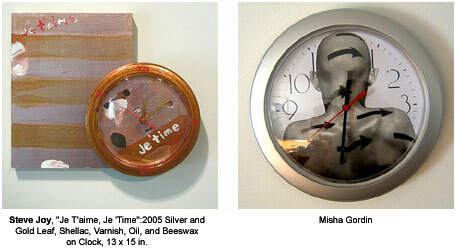 Whether you prefer the sliding clock faces of Salvador Dali or the atomic time-pieces of George Nelson, each Time 4 Love clock will be unique, proving that time is indeed precious. All proceeds from Time 4 Love will benefit the Bemis Center Education Program, which funds educational outreach projects, such as lectures and workshops. Once the Silent Auction is complete, the Bemis Center will continue to make Time 4 Love in its Love Lounge where music and dancing will take place from 9:00 p.m. until the clock strikes midnight. Few things say romance more than champagne, and art lovers will be able to toast one another with glasses of bubbly in the Love Lounge’s special Champagne Bar. Additionally, in the spirit of making Time 4 Love, the Bemis Center will be sharing the love. Our Venus Raffle will give Time 4 Love attendees the opportunity to win a signed, limited edition metal lithograph created by artist Tony Berlant. This 2001 work, entitled Venus – after the ancient world’s Goddess of Love – depicts Marilyn Monroe, the modern world’s Goddess of Love, clad only in a Bemis bag. Venus is based on a real photograph. The story goes that Marilyn would look good in anything – even a potato sack. The Bemis Bag Company took this story to heart and created a special potato sack dress for Marilyn to wear. The ticket holder who draws the Lucky Venus Number gets to take Marilyn home with them. Do you have Time 4 Love? Tickets for this Valentine’s Gala are only $20.00 per person for Bemis Center members and for those timely enough to buy their tickets in advance by calling 402.341.7130. Tickets at the door will cost $25.00 per person. Art lovers with advance tickets can also avoid lines at the door and proceed directly to the Bemis Center’s VIP Valentine’s Table for their silent bidding numbers. Tick-tock, tick tock. Tempus fugit, time flies, so be certain to reserve your tickets and make Time 4 Love at the Bemis Center for Contemporary Arts today.